I have had a lifelong passion for music, not only composing and performing but also finding ways to communicate the benefits and lessons music can bring to others. As a 21st-Century Musician, I have come to realize that music is for life’s sake which explains why I am just as passionate about Samuel Barber’s Adagio for Strings as I am with James Taylor’s recording of Up on the Roof. The 21st-Century Musician appreciates the changing landscape of music today and seeks innovative ways to share music with others. I am a musician who seeks to expand and reinforce the power of music in today’s world. In its simplest form, listening to music typically brings forward a variety of emotions to the listener. In its broadest form, music can transform people’s lives by shaping and enhancing relationships, communities and cultures. It’s my hope that the power and influence of music will thrive for future generations. I’ve spent my entire adult life learning about business and how best to navigate the business world in order to be successful, both individually and ultimately as a leader. While there are many traditional ways to try to understand human dynamics in the workplace, it has been the lessons I’ve extracted from my love of music and specifically playing jazz that have guided me. Over the years I’ve come to realize that jazz, which is so distinctive because of its emphasis on improvisation, is a powerful metaphor for operating in any group or organization, profit or non-profit. These lessons I’ve extracted from jazz have had a profound effect on my business career, my involvement in various organizations and my pursuit of living a creative life. I share just a few of these perspectives on useful principles that can be widely applied regardless of whether you have any training in music. Music enthusiasts and patrons are rightfully concerned about the future of Art Music (defined as classical orchestral, opera, vocal, jazz, Broadway, world and concert band music). Art Music is not dying but it is changing. The DePauw School of Music has created the 21st-Century Musician Initiative which is a complete re-imagining of the skills, tools and experiences necessary to create musicians of the future instead of the past. 21CM.org is an online, professional resource created expressly to help serious musicians thrive, not just survive, in today’s modern musical landscape. The site combines a magazine focused on people, organizations, projects and innovations with live events and educational tools. With this initiative and other efforts, DePauw seeks to transform the professional music school curriculum and student experience with the aim to create flexible, entrepreneurial professionals prepared for the challenges of today’s music world. 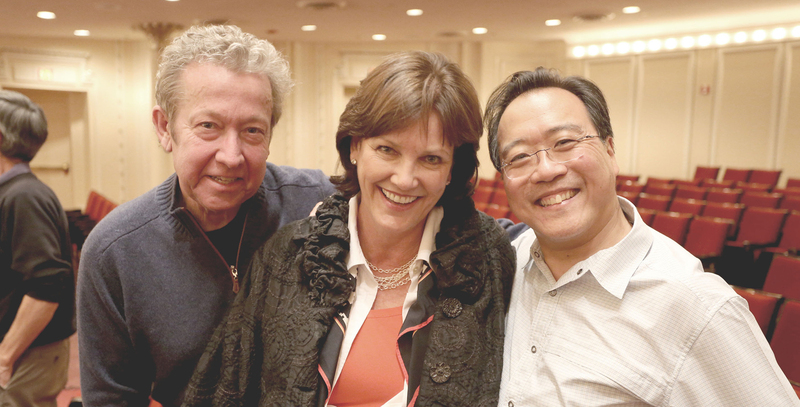 Joyce and I have had the good fortune to work with Yo-Yo Ma for several years and capture some of the “magic” that occurs each time he plays. Not only is he the best cellist in the world but perhaps he’s the best musician in that his passion for the power of music transforms any one musical genre. Yo-Yo has left an indelible mark on the Chicago Symphony Orchestra which can never be surpassed. Among his contributions is his unique ability to continually challenge musicians to excel and express their love of music beyond what is typically expected. His tutoring of the CSO’s Civic Orchestra is a wonderful example of this as he teaches and challenges young talented musicians to new levels of excellence and encourages them to reach out to enrich local communities with their music. As the epitome of a 21st-Century Musician, Yo-Yo explores music as a vehicle for the migration of ideas across a range of cultures throughout the world. The idea for Music on the Square actually came from a comment Yo-Yo Ma made to me about the under-utilization of urban areas. He remarked “wouldn’t it be great to grab an empty storefront and make something of it.” Well, we did. Joyce and I found just such a place in Greencastle, Indiana and we donated the building to DePauw. Today it is a thriving center for teaching, performing and simply enjoying, not only for DePauw students and faculty but also for locals, young and old. There is broad consensus that music education is a good thing! Music lessons and playing in music ensembles are worthwhile pursuits for young people yielding numerous positive results. But why does music education matter? Why are those music lessons and ensemble performances helpful? What is it in music education that can contribute to positive results in life? I want to share why I think this is the case. Simply stated, there are several core skills or attributes which are developed as a result of music education. Also included here are remarks I gave recently to a graduating class at the Merit School of Music whose mission is to transform the lives of Chicago-area youth by providing the highest quality music education – with a focus on underserved communities – inspiring young people to achieve their full musical and personal potential. I would like to offer my thoughts on the diminished scale. For musicians who might be interested, it was such a gift for me to discover the diminished scale when I was learning to play jazz. Call it serendipity! Mastering this scale and how it can be creatively used was a major step in my efforts to learn how to improvise.